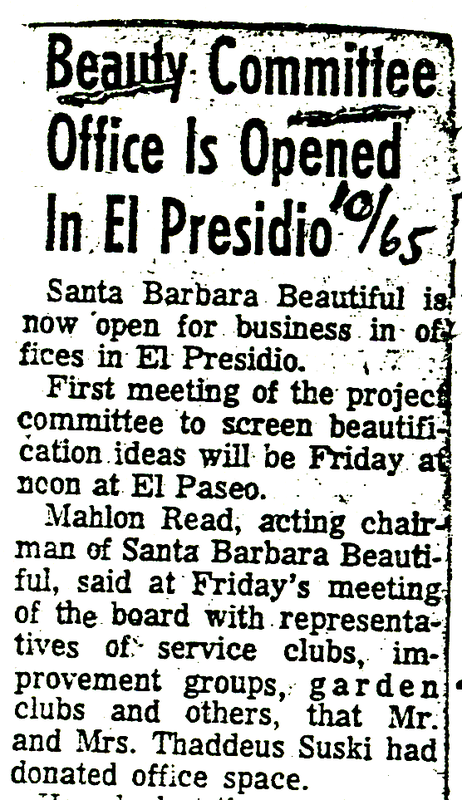 A meeting was held on September 9, 1965 at City Hall for the purpose of establishing Santa Barbara Beautiful as the name of a new developing organization. The founder, Mrs. Catherine Adams, was present, and the founding committee included Mahlon Read, chairman; Miss Pearl Chase (City Plans & Planting); R. Peter Krupszak, Secretary (Ge–Tempo); Stan C. Lowry (Chamber Of Commerce); and Michael Pahos, city landscape architect. At this meeting Miss Chase offered a quotation from Abraham Lincoln that says “I like to see a man proud of the place where he lives.” She said she felt a motto could help to crystallize community thinking and stimulate interest. Thus the idea for Santa Barbara Beautiful took root. 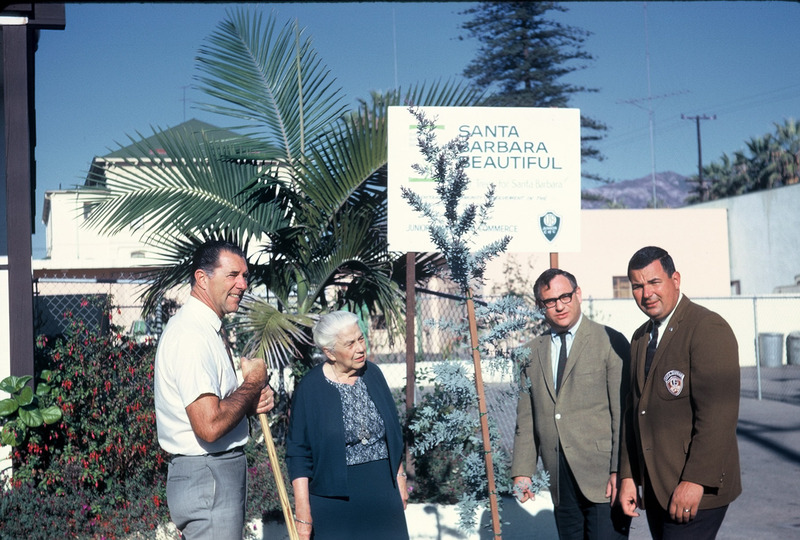 Santa Barbara Beautiful was formally inaugurated at a dinner which took place days later, on September 15, 1965 at the Miramar, launching the active, achievement-oriented civic organization. The fledgling organization with R. Peter Krupszak as President, held its first meeting in 1966 on January 19 at El Paseo Green Room. By September of 1966, Santa Barbara Beautiful had 17 Board members. The first awards program was carried out by the organization in 1966. That year commercial and industrial firms were recognized, as there was a need to encourage improvement. The judges included architects, landscape designers, and laymen active in garden clubs. The awards certificate, designed by James “Bud” Bottoms, was used at this first affair. For many years, Santa Barbara Beautiful commemorated Dr. Pearl Chase’s birthday as a part of the program during the annual awards banquets. Roses from the Mission Rose Garden were used to decorate every table. The story of the life of Dr. Chase (1888–1979) is very well known, but perhaps it is not so well known that she was one of the founding members of Santa Barbara Beautiful. She was an active participating member of the Board of Directors down through the years. Her contributions were many. Both Dr. Pearl Chase and Jim Hodges dearly loved trees and all growing things, and they strongly supported the Street Tree Planting Program. 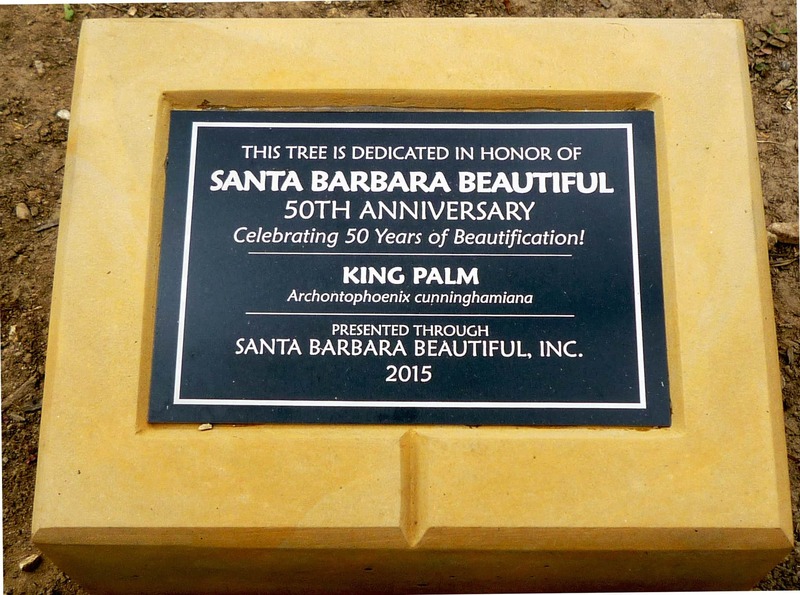 Consequently, the Board of Directors of Santa Barbara Beautiful established a “Tree Replacement Memorial Fund” to honor these two board members. Approximately 300 street trees are lost every year due to disease, old age, weather, or vandalism, so this ongoing fund will serve to assure the replacement of the lost trees.